Hello dedicated followers and newcomers alike! After taking some time off from blogging, I have re-emerged in the blogging world, and will be posting on (and for the most part running) Bleachers to the North, a Toronto sports blog that will be Blue Jays heavy. Why Not Move Philles-Jays Series to Las Vegas? News that Roy Halladay was not in fact coming to Toronto in late June this year was painful for Blue Jays brass and fans alike. The ceremony that had been planned out since the December trade of the pitcher falls through with this news, and instead the Jays will simply play their ace in Citizen’s Bank Park in Philadelphia. Sure, the Jays will be officially recorded as the home team, and the Designated Hitter rule will be used, but it’s just not the same. There’s good reason for moving it too, the G20 Summit security restrictions will be too great to host three ball games at Rogers Centre as most of the downtown core is to be shut down. This left me with a good idea about what to do with the series: Move it to Cashman Field instead, home of the Blue Jays’ AAA affiliate Las Vegas 51s. This would enrich the 51s fan base, as they would be able to see the stars that graduated from Nevada once again, as well as providing three sure-fire sellouts. The series would create a sense of loyalty to the Blue Jays as well, teach Las Vegas fans that the Blue Jays deeply care about their minor league affiliates. The 51s are away in Fresno both the 26th and 27th of June, the only game that would need rescheduling would be the June 25th game against Sacramento, but really, they could just play that game at 1:05 pm and the Major League game at 7:05 pm, avoiding conflict. 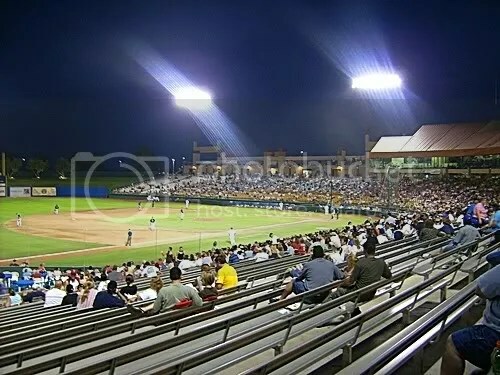 If playing it in Las Vegas isn’t possible, New Hampshire would also be a possibility, as the Blue Jays AA affiliates are away on every day of the Phillies/Blue Jays series, and Bedford, New Hamsphire is a whole lot closer to both Toronto and Philadelphia than Las Vegas is. And why wouldn’t the Blue Jays ownership be allowed to relocate their home games? Moving it to Philadelphia isn’t fair. Home-field advantage is very real, not to mention playing it in Philadelphia would give the Phillies extra revenue, if anything the Phillies should be obligated to give at least half of the revenue from the game to the Blue Jays. Fred Lewis, acquired in a mid-April trade from San Francisco, is turning into a key component of the Blue Jays. While he started off slow for Toronto, he’s really turned it on in May, hitting .429 with five extra-base-hits, including some very deep doubles. Not to mention that slotting him in leadoff in place of Jose Bautista has really revived Bautista’s prowess at the plate, who’s certainly been more productive since Lewis joined the club. Travis Snider has also been heating it up as of late, batting .417 in April with four extra-base hits. The big thing I’ve noticed about him is that he’s been getting much better contact, and driving the baseball hard. He had a flyout yesterday that was about a foot and a half from flying over the fence – and Shin-Soo Choo’s glove. The Jays had a game to play yesterday, and what a game it was. In the top of the ninth, Cleveland’s (interim) closer Chris Perez allowed a deep double to Fred Lewis with two outs, and then induces a soft grounder from Aaron Hill straight at the shortstop Luis Valbueno to end the ballgame – yet Valbueno lets the ball go right through his legs and lets Lewis score to put the game at 4-3 Cleveland. You could tell Chris Perez wasn’t very impressed and he let it get to him, as Adam Lind took Perez for a two-run home run to right to put the Jays ahead 5-4. With Jason Frasor pitching for a single out in the eighth, he came in for the ninth as well as shut down the Indians to lock up the win. Brandon Morrow pitched well in the game, although he only went 5 1/3 with three earned runs, he struck out nine with his fastball that touched 100 multiple times. Since he sometimes struggles through games and get’s lit up, I’m very happy with how he pitched this outing. Meanwhile the question most Blue Jays fans are asking is, “What happens to the lineup when Edwin Encarnacion returns from injury? With Fred Lewis coming in, the Jays logjam of batters has gotten even worse and something drastic will have to happen when Encarnacion gets back. With Jose Bautista currently starting most games at third base, and Travis Snider or Fred Lewis unlikely to sit in favour of either Encarnacion or Bautista, it really comes down to who’s more valuable for the Jays: Bautista or Encarnacion? They’re practically the same player hitter-wise, low-average players with 20-home run power and some speed. I think that Encarnacion will get slowly put back into the starting role as he has the most potential, with Bautista starting every four or five games, while getting some outfield starts as well. Brett Wallace went 3/5 last night with a double, a walk, and two runs batted in, leading Las Vegas to a 13-7 win over Reno. With his efforts he has pulled his average back over .300 to .304. At AA, Kyle Drabek took the loss against New Britain while putting up a confusing stat line: 5 2/3 innings pitching with one earned run and a 7/2 strikeout/walk rate, good numbers for Drabek. Yet he managed to also allow 5 unearned runs, which ran his record back to 4-2. Brett Wallace has been tearing up AAA as much as Vernon Wells has been tearing up the Majors. With a .292 average and 7 home runs in 65 at-bats, Wallace doesn’t seem to have any holes in his swing. He’s leading the Pacific Coast League in homers. There’s no question in my mind that he should get called up by the first week of June, when almost all the other prospects in his draft class will get the call. The only problem is that with the logjam of Blue Jays 1B/DH players, something drastic will have to happen to get him playing time. To get Overbay out of the picture, he’s going to have to either play really good to be valuable in trading, or he’ll have to play really bad so that there’s no controversy if Wallace would start over him. If he keeps turning his season around and has a decent .265/.360/.450 line by the start of June, Wallace will have to wait his turn and keep playing in AAA. But really, Alex Anthopoulos isn’t going to delay the progress of Wallace, he has his straight-forward rebuilding plan, something that J.P. never had. That was the thing with J.P. Ricciardi, he was never ready to admit that he core wasn’t good enough to win, he was always try to make ‘this’ the year, costing the team key prospects and cash while giving fans false hope. Pitching in AA New Hampshire, Drabek started a bit slow, but was terrific in his last start, pitching 5.2 shutout innings, lowering his ERA to 3.80. The Jays are playing conservative with him, not allowing him to pitch 6 innings in any of 4 starts this season. Many see Drabek as a late-2010 call-up, but I think he still needs a lot of work and should finish the season in AAA, being an early-June call-up in 2011. The key component of the Scott Rolen deal, Stewart has closer stuff, but as I’ve mentioned before, the Jays see him as a starter despite him getting destroyed in his professional starts. Stewart has gotten … shelled so far in AA New Hampshire. In 9.1 innings, he’s allowed 8 earned runs, so for all those people projecting Stewart to be a 2010 call-up: he’s going to have to get a lot better to earn it. Lyle Overbay had his first mult-hit game of the season, going 2 for 2 and reaching base a total of four times, upping his OBP to .203, still terrible, but he’s on the right track. Jose Bautista hit two homers and Travis Snider added a solo shot. This is a great sign for the Toronto Blue Jays going forward, Bautista is picking it up and should get slotted back to leadoff by the time Aaron Hill gets back if he keeps hitting like this and Snider needed this homer to pump up his confidence. against the futile Royals, no-hitting them into the 6th inning and boosting his confidence going forward. He’ll need this confidence in his next start against the Rays. Morrow’s success postpones my plan to get Cecil, Mills or Robert Ray into the rotation, so they’ll have to wait for Tallet’s inevitable implosion. Tallet is much better suited for a long-relief job, the problem with him is he can never work past six innings and usually gives up 3 runs along the way. Brett Wallace continues to mash at AAA headquarters in Las Vegas. He went 2/5 with a homer last night, keeping his OPS over 1.000 with a .302 AVG. He should be one of the first call-ups in June, there’s really nothing else he needs to learn at AAA and the Jays could use another bat. The Blue Jays play the second game in their series against the Kansas City Royals tonight at 7:07. Dana Eveland takes the mound against Kyle Davies. Eveland should have another good game and the Jays have a good chance to rough up KC pitching for the second straight night. The Toronto Blue Jays currently sit at 7-5 after a blistering 6-1 start. Vernon Wells continues to play well, and much of the Jays pitching staff is playing fantastic, but the wheels are falling off – and in front of few fans. I actually can’t wait for the Jays to play the Red Sox, Yankees and Rays, because at least that will draw an audience probably in the 20,000 range for each home game against the AL East powerhouses. I was ecstatic when we acquired Brandon Morrow in a trade straight-up for Brandon League, and it’s certainly still in win-win territory (Jays give up dime-a-dozen reliever not part of their future for a former first-rounder with potential), but Morrow just hasn’t looked good in his first two outings. In two starts he has a 12.00 ERA in 9 innings against Baltimore and the White Sox, hardly potent offenses. Sure, give Morrow two more starts to work things out, but if he finishes April pitching like he’s been, it’s time to put him in a long-relief position and bring up either Brad Mills or Brett Cecil, both of whom have been pitching great in Las Vegas and really, you can’t do harm as they’ve already played at the major league level and succeeded. Also on the 51s is Brett Wallace, who’s had a huge first nine games of the season, homered four times with an OPS of 1.092. I’ve said it before, but I have incredible faith in Brett Wallace, he’s an fantastic player who won’t struggle as a rookie given his amazing plate discipline. That’s what sets his case apart from the Travis Snider buzz of last year, Travis Snider has started off slow because he strikes out too much and doesn’t get good pitches. Brett Wallace will put up .400 OBP seasons from his second season until his 15th, with a great rookie year to start it off. If Brett Wallace is still putting up an OPS of 1.000 by late May, and Lyle Overbay is still slumping, it’s going to be awfully hard to not call him up. After a blazing 5-1 start including a clean sweep of the Orioles, it’s getting hard for baseball analysts to explain their predictions of 100 losses for the club. Especially given many of those losses were to be at the expense of Baltimore, pretty much the consensus to finish 4th in the AL East. There they were Sunday, in the finale of their series with O’s. Yet this game was different, not pitching-wise, in which Shaun Marcum delivered another gem, going 6.0 strong innings with 2 earned runs and allowing 9 baserunners. What was different was the source of runs, Alex Gonzalez homering not once but twice and the other runs coming off Encarnacion and Bautista homers. Did anyone expect A-Gonz to be tied for the major-league lead in homers, with who else but Vernon Wells? It’s certainly good news for the club, as so far their shortstop switch with Boston is looking like a good move, with Scutaro already providing a costly error, and not providing nearly as good a bat as Gonzalez. But back to game, I was certainly worried with the game going into the 8th, as Kevin Millwood was putting up a gem and had only thrown about 70 pitches through seven. But I could tell that he was getting impatient with Bautista, and sure enough Bautista took him for a ride in a big way, putting the club on top with a narrow lead. But, feeding on the confidence and on Millwood’s sudden shakiness, Encarnacion belted a second homer to widen the gap and give me confidence that they Jays had it all but locked up. Amusingly, Casey Janssen pitched the seventh and picked up his majors-leading third win of the season, and Downs pitched a perfect eighth to cement his 0.00 ERA. Kevin Gregg came in for the save, giving him two on the season, one less than our full-time closer Jason Frasor. The Jays open the Rogers Centre for the season tonight, facing up against the Chicago White Sox. Aaron Hill may play in the game, according to Cito, and Brian Tallet will take to the mound, while Jake Peavy will pitch for the ChiSox. If Aaron Hill is back, I think he’ll hit a home run for sure and power the Jays to a 7-5 victory, with Tallet having one of his familiar 6 IP, 3 ER games and Jason Frasor picking up the save. welikeroywelikeroy on Roy Halladay: Best Blue Jay. Ever. bluejays49 on Rogers Centre Report Opens! sachinrahulman@hotmail.com on Rogers Centre Report Opens!